Assam is a State in Northern India. Assam, India is located in the northern part of the country. It was officially established on August 15, 1947, after India gained its independence from British rule, but the region's history goes back much farther. The state's land area is 30,328 square miles and it shares borders with the Indian states of Arunachal Pradesh, Nagaland, Manipur, Mizoram, Tripura and Meghalaya and shares borders with Bhutan and Bangladesh too. It has an interesting land layout consisting of the Brahmaptura and Barak river valleys and the North Carchar Hills. The geography here is diverse in part because the state is located just south of the eastern Himalayas. The state is home to the famous Kamakhya Temple, which represents people of many different races, religions and cultures that migrated to this location. This landmark is one of the state's many Temples; some others are Babagraha, Umananda, Basisthashram, Mahabhairab, Madan Kamdev, and multiple Satras. Satras are like monasteries that promote Vaishnavism, a popular tribal religion followed in this area. The population here in 2011 was 31,169,272 people, making it India's fourteenth most populated state. It's famous for Assam Tea and is important for wildlife lovers too. It's home to the one-horned Indian Rhinoceros, tigers, numerous bird species, and is one of the world's last safe havens for the Asian Elephant. Needless to say, it's becoming a popular destination for wildlife tourism. Excavations have proved that man was present here during the stone age. During India's ancient culture, many dynasties ruled over this region. There was a time in India's modern history, between 1817 and 1821, when people here aided the British in invading the Burmese, but this turned out to be a huge disaster because the Burmese overtook the state and ruled it for some time. In 1824, the Burmese reached the borders of the East India Company; this led to the first Anglo Burmese war, which continued until known as the Treaty of Yandaboo was signed in 1826. The British controlled the state for a long while, but once the Indian National Congress was established in the early 20th century and Assam joined ranks against the British. Following India's gain of independence from Britain, there were large cultural splits among the different ethnic groups of the state. The primary religions followed here are Hinduism, which accounts for more than half the population, Islam, Christianity, Sikhism, Buddhism, and Jainism. 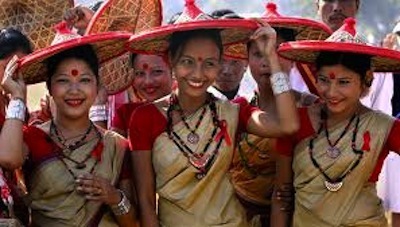 Assam's culture is diverse it is made up of cultural aspects of many different ethnic groups. The primary languages spoken are Assamese, Bodo and Bengali. Agriculture makes up one-third of the economy and provides work for sixty-nine percent of the people. It also plays a role in shaping the lifestyle of the people. There is a major statewide celebration that takes place here called Bihu. It's the festival that marks the seasons and important aspects of farm life over different growth cycles. As such, a different celebration is done at the change of each season. Traditional crafts are made by people here. They include brass items, such as dishes, metal bell items used for worship and festivals, and manuscript paintings that tell different stories. Other popular crafts include bamboo and canes crafts, rugs,pottery, jewelery, painted art and ivory sculptures. The state also excels at making boats, gun powder and guns. The economy here took awhile to catch up with the rest of India. For a long time, the state only experienced half the growth it should have, in comparison to the overall Indian economy. However, in the last decade it has caught up! A large part of the improvement is owed to supplying about twenty-five percent of India with oil drilled in its boundaries. The state capitalizes on tourism too. In addition to the amazing temples and monasteries mentioned earlier, the state boasts Wildlife preserves called the Kaziranga National Park and Manas National Park, which showcase animals, such as the Great Indian One-Horned rhinoceros. There are fresh water islands and scenic areas unlike anywhere else. Interestingly, the only male river in India can be seen here as well, it is called the Brahmaputra. Assam is definitly a place worth visiting! Leave Assam to discover the other India States. Check out these useful tips for traveling to India.